Every year around this time, college basketball rules the sports world. The upsets and thrilling finishes of March Madness captivate sports fans across the country as brackets are busted and presumed favorites are sent packing early. Stars are born and some of the game’s most memorable moments are created. 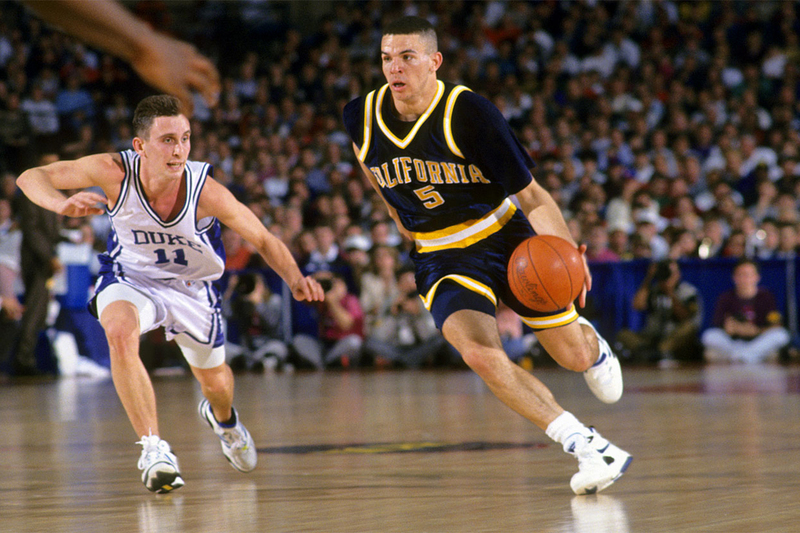 In the 1993 NCAA Tournament, Jason Kidd and the Cal Golden Bears left their mark during the tournament’s opening weekend, first with a thrilling triumph over LSU and then with a surprising upset of the two-time defending champion Duke Blue Devils. Kidd’s team entering the tournament was talented, but still very young. They finished second in the Pac-10 that year, which earned them a No. 6 seed, so no one was expecting much from Cal, a program making its second appearance in the Big Dance since 1960. LSU raced out to a 36-29 halftime lead, hungry to pull the upset, but J-Kidd and the rest of his Cal teammates remained poised under pressure and fought their way back into the game, proving that they were built for the big stage. J-Kidd finished the game with 16 points, seven assists, seven rebounds, five steals and just one turnover. No play was more important, however, than his final bucket of the game, which completed the comeback and sealed the win for the Golden Bears. “He’s a big-time player and big-time players live for moments like that,” Cal coach Todd Bozeman said. Kidd scored the game-winning basket on what would become known as “The Pretzel Shot,” as J-Kidd twisted his way to the bucket and finished in traffic to win the game 66-64 and move on to the second round. Two days later, the Golden Bears would face their toughest challenge yet in the Duke Blue Devils, who were led by Grant Hill. 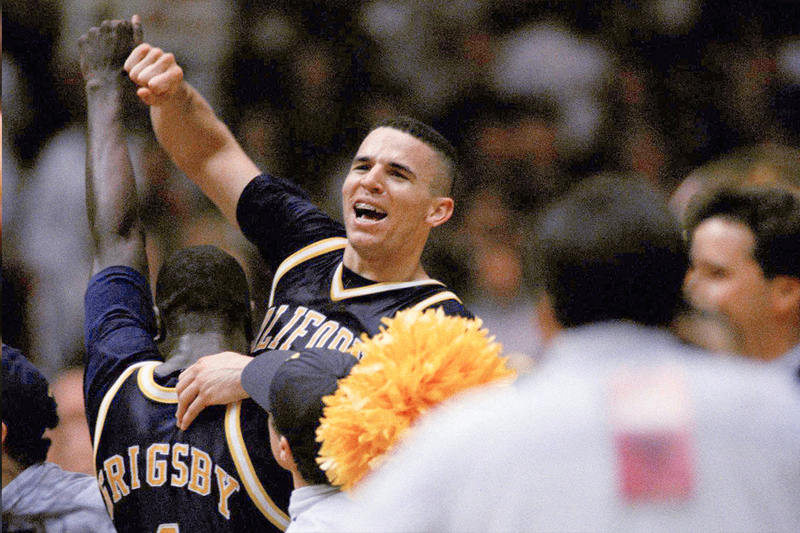 Most of the college basketball world didn’t even consider Cal as a threat to the two-time defending champions, but J-Kidd had other plans. Kidd delivered another spectacular performance, posting 11 points, 14 assists, eight rebounds and four steals as Cal built a huge early lead. Cal led by 10 at the half and put everyone on notice. However, Duke didn’t panic and came charging back in the second half as their talent and experience began to take over. Bobby Hurley, in particular, did most of the damage in the second half for Duke. He scored 32 in the game, including six three-pointers, which was vital in bringing Duke back into the game. Duke ended up taking the lead and led by one with about a minute and a half to go. Despite being young, Cal found a way to beat the team that seemingly always came out on top. Many times in the tournament, games come down to a few lucky bounces, a hustle play and free throws, and in the final minutes, Cal found themselves on the right side of luck to close out the game and dethrone Duke. It was a wild opening weekend upset, the kind you seem to only see in March. A variety of factors played into it, and J-Kidd played a big role as he went toe-to-toe with Grant Hill and Bobby Hurley. This moment will always be etched into NCAA Tournament lore, as it was one of the most shocking results in NCAA Tournament history against one of the most prestigious programs in the country. With about a minute and a half left, we were down by a point and had possession after rebounding a miss by Duke. I started running it down to the other end of the floor, trying to do everything by myself. I took a bad shot at the same time as Grant Hill tried to take a charge. The ref didn’t blow the whistle, and we ended up getting the ball back because it deflected off of Grant before going out of bounds. If I were a better passer at that point in my career, I would have found the right guy. This play is also a perfect example of the importance of slowing down and playing under control. We inbounded the ball and that’s when I made a play that I can only describe as lucky. I was trying to pass it to one of my teammates in a tight window and the ball got deflected back to me for an and-one layup. I sank the free throw to put us up two points with a minute left. That was when I actually started thinking we could win this game. There was a whole lot of time left, but we were one stop and one score away from pretty much putting it away. And that’s when the somewhat unthinkable happened: Grant Hill got called for a traveling violation with 49 seconds left in the game. I was right there to make the call. At that point, it became a game of free throws, and I wanted the ball in my hands. After I was fouled, I even told the TV announcers that I was going to sink both of them. Somehow, we ended up with an even more positive result than that. I made the first free throw, and the second one hit back iron and then ricocheted off one of our players’ hands and onto the leg of a Duke player, who kicked it out of bounds, giving us possession. We had the ball and a three-point lead. Want to see how loose we were playing in this game? Check out the inbounds pass I made to Alfred Grigsby. Duke was looking for a steal, and I lofted a pass over Chris Collins’s shoulder right to Alfred on a cut. That play was about trust and understanding your teammates. I liked inbounding the ball back then because it allowed me the opportunity to take chances like this sometimes. When you’re the underdog, you should use the lack of expectations to your benefit by remembering that basketball is fun. If you play with that attitude, good things can happen. We missed the free throw that would have given us a two-possession lead, and then Duke had one more shot at tying the game. Bobby Hurley got a great look. Lamond Murray had to get up there to grab the rebound. He had a monster game for us. And then he sank free throws, and it really dawned on us what we had done. We took a two-possession lead and never let go of it. We did what nobody thought we could do. We beat Duke. A lot of basketball fans said that we pulled off a miracle that day. I’m not going to argue with them.